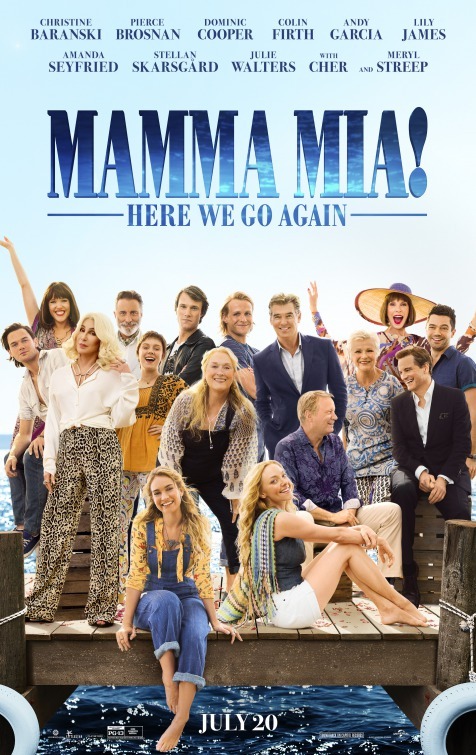 Synopsis: Five years after the events of Mamma Mia!, Sophie will find out more about her mother’s past, including how she fronted The Dynamos, started her villa on the island from nothing, met each one of Sophie’s dads, and raised a daughter. Review: I happened to be in London in January of 2000 and was able to catch the original London cast of the smash hit, Mamma Mia! It was one of the most exciting nights I’ve had in the theater, not just because the show was enormously entertaining but because the audience just went absolutely nuts for it. I was in the highest point of a steep balcony and watching grown men and women shaking their groove thing to the finale megamix without fear of falling was a sight to behold. In touring productions over the past 18 years I’ve seen the same effect, audience members that came in looking glum but leaving with a crazed look in their eyes. 2008’s Mamma Mia! was a surprise hit, though anyone that didn’t expect a global phenomenon starring one of Hollywood’s most A-list stars to rake in some kind of cash likely isn’t still working in the industry today. Released in the summer months when people were tired of explosions and CGI, it was a perfect (if slightly underwhelming to me) summer antidote to the loud and noisy fare ticket buyers were bombarded with. If anything, it showed us how star Meryl Streep (Hope Springs) could turn even the silliest project on paper into a fully-formed performance with feeling. When a sequel was announced, I was fairly surprised. After the box office success of the first one, it’s not that a sequel was unheard of, just unexpected. Hearing the gang was getting back together again with a few new additions was interesting and with new songs from the ABBA catalog being added the stage was set for a repeat of the fun frivolity the original almost outright encouraged. 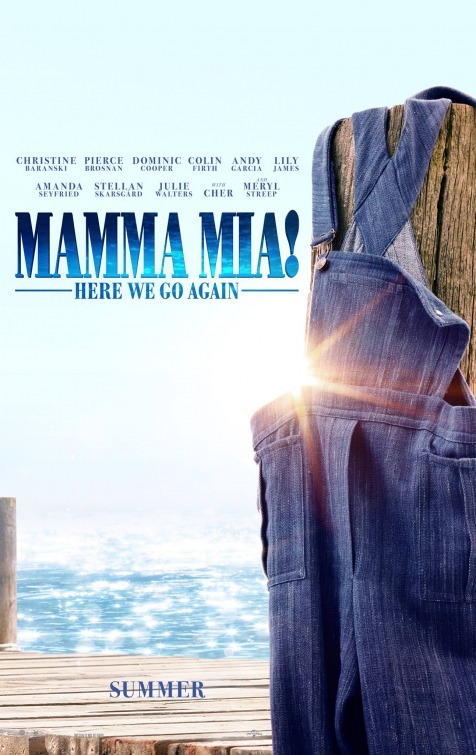 Look, times are hard enough as it is so when movies like Mamma Mia! Here We Go Again are released there’s a certain amount of goodwill restraint I believe critics should utilize because while this is far from an equal, this prequel sequel has its heart and, often, voice in the right place. So now we reach the point where we can’t go on without a few spoilers, but nothing that hasn’t already been hinted at by the trailers. It’s been five years since about-to-be-wed Sophie (Amanda Seyfried, Love the Coopers) invited three men she thought might be her father to a taverna on a remote Greek island without telling her mother they are on their way. Comic and musical hijinks were the result and the film, like the stage musical it was based off of, ended with a spandex and platform heeled finale set to ABBA’s Waterloo. Now, Sophie is re-opening the hotel one year after her mother’s death while harboring a growing secret of her own. As the guests arrive, the film bounces back and forth between the present and 1979 to see how Donna (Lily James, Cinderella) came to the Greek fantasy island and made a life for herself. It’s rough going for the first twenty minutes or so as the film dives headfirst into exposition and a few lesser known ABBA songs. A strange musical opening set at Oxford has valedictorian Donna doffing her cap and gown for a lycra bodysuit to bump and grind through the sunny but silly When I Kissed the Teacher along with her fellow Dynamos, Rosie (Alexa Davies) and Tanya (Jessica Keenan Wynn). It’s an off-kilter and gangly way to introduce us to Donna and the film stays safely in idle mode until she lands in Paris and meets young Harry (Hugh Skinner, Les Miserables) before heading off to Greece where she’ll sail away with young Bill (Josh Dylan), and fall in love with young Sam (Jeremy Irvine, The Woman in Black 2: Angel of Death). While we’re getting this backstory, the events taking place in the present aren’t always as sunny. Sophie and Sky (Dominic Cooper, Dracula Untold) are halfway around the world from eachother and experience the stress of a long-distance romance (explained in a sketchily sung One of Us) and other dads Harry (Colin Firth, Magic in the Moonlight) and Stellan Skarsgård (Avengers: Age of Ultron) can’t make the re-opening due to business commitments. Tanya (Christine Baranski, Into the Woods) and Rosie (Julie Walters, Film Stars Don’t Die in Liverpool) do arrive and try to brighten Sophie’s spirits when a storm threatens to derail the proceedings. It’s all set to a songlist from the ABBA canon, many repeated from the original film to lesser results. The old songs new to the sequel are clearly B-sides for a reason, though Baranski and Walters have fun with Angel Eyes. The biggest success is likely Dancing Queen, a highlight here just as it was in the first outing. It’s a huge production number set on land and sea, you’ll wish all boat rides had such excellent choreography. The overall problem I had with the movie is that it feels like a project crafted around the availability of its returning cast. The movie was shot in London and plenty of it is done on green screen to recreate the Greek setting. Add to that a handful of cast members that feel like they filmed their scenes in several days (no surprise many did) and the film feels a bit clunky and unkempt. That being said, it takes about 90 minutes for the film to find any kind of rhythm or shape and that just happens to be the time that Cher (Mermaids) stops by. It’s widely known Cher turned down the role of Tanya when produces approached her about it but we should all be glad she signed up to play Ruby, Sophie’s grandmother (try not to do the math when you consider Cher is only three years older than Meryl Streep), a Las Vegas entertainer not much for family gatherings. Not long after Cher shows up and sings a bang-up version of Fernando, none other than Streep herself appears in a scene/song you’ll need some tissues for. It shouldn’t have, but it honestly caught me off guard how moving her performance was and it serves as a wistful reminder of the below the surface heart the rest of the movie was missing. Writer/director Ol Parker (The Best Exotic Marigold Hotel) might not improve on the formula introduced in Mamma Mia! in terms of cleverly blending songs in with the action but his film marks a vast improvement visually. He lets the camera take in more of the large action and dancing scenes, instead of quick cuts around the dancing he makes good use of the widescreen vistas. Like the first film, expect Greek tourism to get a bump from the lovely displays here. Synopsis: The film will go back and forth in time to show how relationships forged in the past resonate in the present. Thoughts: It has been a decade since the boffo stage hit Mamma Mia! danced its way to the big screen and made millions but it was a bit of a puzzlement when this sequel was announced. Where did the film have to go and how many more ABBA tunes could be culled from their catalog for the characters to sing? This first look at Mamma Mia! Here We Go Again (ugh, that title!) has arrived and, I warn you, it’s fairly alarming. The sun drenched Greek setting is back as are most of the buoyant cast members…but someone is noticeably absent from most of the merriment. Meryl Streep…or to be more specific, Streep’s character. Sure, Streep (Hope Springs) is present in flashes but she’s not front and center like the original film and that’s inspired people to ask if the filmmakers killed her character off. Not sure how I feel about that and even more unsure if it’s wise to make this a prequel when the back story was such a flimsy throwaway in the first place. Director Ol Parker (The Best Exotic Marigold Hotel) has brought on Lily James (Darkest Hour) to play Streep in her twenties and landed Cher (Mermaids) to play her mother (!!!). No question I’ll be lining up to see this but if it’s going in the direction I think, I’m already blue since the day I first saw this trailer. Synopsis: Two hopeful new arrivals at The Best Exotic Marigold Hotel for the Elderly and Beautiful quickly learn that there is only a single room left to rent. 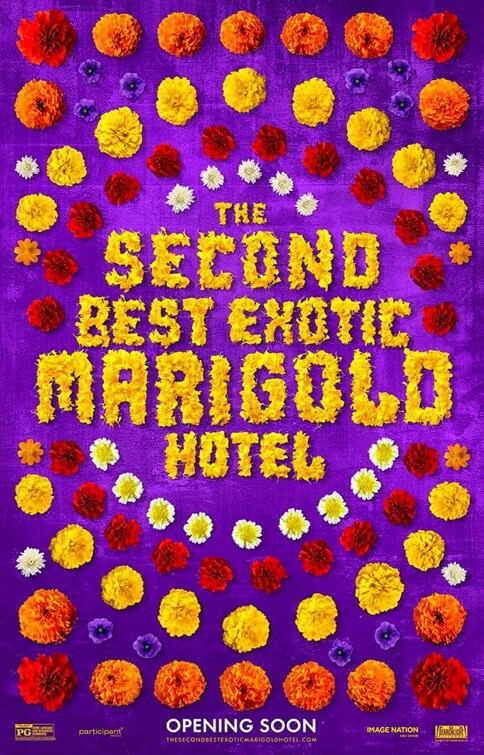 Thoughts: A surprise hit that built dynamic staying power thanks to good word of mouth when released in early summer of 2012, The Best Exotic Marigold Hotel was a pleasant bit of fluff that benefited greatly from its starry cast of over the hill talent. In an interesting move, a sequel has been constructed that reunites the cast, writer, and director of the original in hopes that audiences will want to check-in again. I wasn’t knocked out by the first film but in all honesty by the time I saw it the hype machine was in full swing so I’m chalking my middle of the road feelings toward it up to overly lofty expectations. Based on the trailer for the sequel, it’s more of the same in store but when you have a cast featuring Judi Dench (Skyfall), Maggie Smith (Quartet), Richard Gere (American Gigolo), and Bill Nighy (About Time) I have little reservation about making a, uh, reservation.